"The dog-eared pages of To Kill a Mockingbird, a copy of Lad: A Dog that has a chunk missing from its cover (perhaps taken by canine teeth? ), crayon scribbles on The Velveteen Rabbit, the broken spine of Treasure Island, and The Hunchback of Notre-Dame braced by tape, all recall the shared experience of library literature. Mansfield’s photographs give these imperfections a quiet dignity." "Her “Expired” series, which is currently comprised of 175 photographs, has been collected into a beautifully bound volume (though we’d love to see what it will look like after a few years in a library); you can buy it on her site, and she was kind enough to share a few images from it for this gallery." 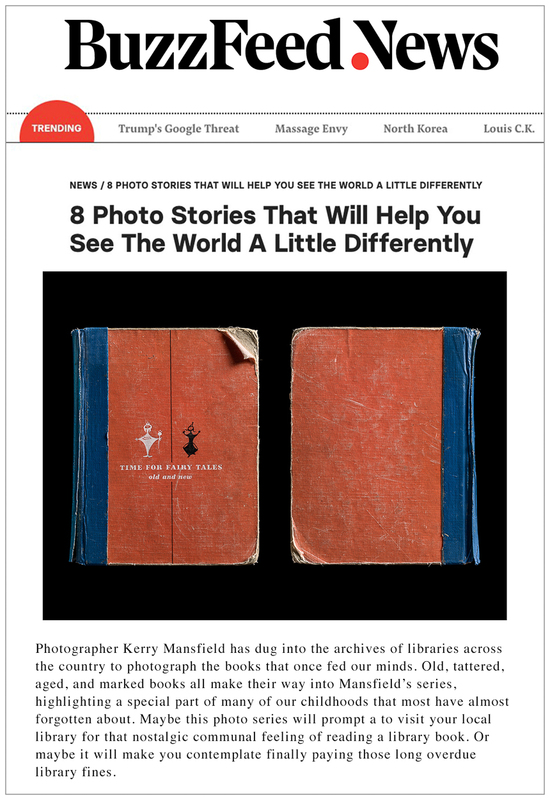 "Mansfield sets out to convey that each book has traveled a unique path through the world, and she accomplishes this with a simple, clever, effective strategy: she visualizes them in a way that removes them from the world entirely, in a photographic limbo that does nothing less than invite us to consider an expired book as a metaphor for the relationship between body and soul."